Interviewer: Maharishi, I start with those main attacks which have been brought up against you and your Transcendental Meditation movement. In relation to the plan to establish an academy for Transcendental Meditation above the lake in Seelisberg - the Catholic inner part of Switzerland. One attack I have already mentioned that you are against Christianity and also against the person of Jesus Christ. Maharishi Mahesh Yogi: Any TY ending is very close to me with infinity. So my message is that of Infinity and Christianity and Infinity both meet towards the end. So there is a meeting point in the goal towards the end - Christianity and Infinity and therefore if they are two parts they meet in the end. All is well that ends well. All is well that ends well. There is no opposition to Christianity - I love Christ very much and he must be enjoying with all this growth of infinity in the individual life because "find the kingdom that lies within you" I think has been the main teaching of Christ. And therefore Transcendental Meditation which takes the awareness to that level which Christ wanted every Christian to have is only a friend of Christianity. Maharishi Mahesh Yogi brought Transcendental Meditation to the world more than 50 years ago and now it has been enjoyed by millions of people worldwide from all religious backgrounds. Dr. George Rutherford, one of the most distinguished and beloved principals in the Washington, D.C. area, is credited as being the “Grandfather” of the TM/Quiet Time program in America. 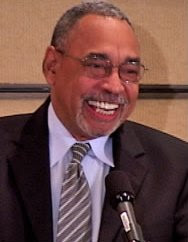 In 1993, Doc Rutherford introduced the program to his Fletcher Johnson Learning School in Washington and later expanded it to include the entire school—a first in U.S. education. He also serves as the National Co-Director of the U.S. Committee for Stress-Free Schools. How did you get started with the TM program? In 1993, teachers of the Transcendental Meditation program came to the Fletcher Johnson Learning School to give a presentation. I was standing at the back of the room joking with one of the teachers, saying, “I want to get the training.” She knew I was joking but she called my bluff and made an appointment for me. I was scared to death, but I learned the TM technique and loved it! Then I visited Maharishi School of The Age of Enlightenment in Iowa. When I saw how those children were happy and enjoying school I was inspired to give this to my students. I thought this program could really make a difference in their lives and in this community. How did you introduce this program to the Ideal Academy Public Charter School? Paulette Bell, the founder of the school, wrote a proposal for a stress management program and the Board of Education signed off on it. We didn’t have any money, but donors came forward and helped get my children where we are now. We shaved off 5 minutes from each class to make time for the children’s TM/Quiet Time program in the morning and afternoon. We knew that once we got rid of the stress, we would have less disruptions and the time would pay off. Now we are seeing the light. Quiet Time changed the whole climate of the school. It was just beautiful. What have been the greatest benefits for the school? All the students from 5th grade through 12th grade practice the TM/Quiet Time program. In the morning for those 15 minutes before class the whole school is quiet and the calm is carried throughout the day. The greatest benefit is relieving the stress. We know that some of the kids would be more hyper without their meditation. Some of our kids have ADHD. A lot of kids are special needs kids. I always say a lot of kids are special needs who don’t have the papers on them. They have not been identified. With Quiet Time the academic achievement has gone up, and behavioral problems and absenteeism have gone down. I could never work in a school that doesn’t have the TM/Quiet Time program. What is your vision for schools in America? I would love to see that all students are able to learn in a stress-free environment. You can rest assured that in years to come the transformation in education will take place in schools with the TM/Quiet Time program. People are going to see that the Quiet Time program removes stress and everything else falls right in place. With Quiet Time, the potential of every student is unlimited.